Borrowdale is a really beautiful valley and has much to offer not only to the fell walkers but to the lowland visitors as well with hotels, guesthouses, B&B’s, holiday cottages, youth hostels and campsites. Seathwaite is a hamlet situated at the end of a no-through road in the Borrowdale valley in the Lake District of Cumbria. The hamlet was a very secluded place until fell walking became very popular and the walkers started to park their cars on the verges. Seathwaite has now become one of the most popular starting points giving access to the mountains such as Brown Base, Glaramara, Great End, Great Gable, Green Gable and Scafell Pike the latter being the highest mountain in England standing at 978 metres. Seathwaite and Seathwaite Fell, which is about a mile south of Seathwaite and takes its name from the hamlet, are the wettest places in England and quite often flood. In 1966 five inches of rain fell in an hour damaging Stockley Bridge which is an ancient packhorse bridge on the old route between Borrowdale and the Cumbrian coast and for centuries the packhorses carried goods such as wool, salt and Charcoal. The bridge was constructed in 1540 and widened in 1887 and is designated as a Grade I listed building because of their rarity in the area. Around the mid 1500’s graphite was discovered close to Seathwaite and this graphite was pure and solid which could be easily cut into sticks thus the pencil industry in Keswick was born. The mine closed in 1891 and remains the only deposit of graphite ever found in this solid form. The locals also found it very useful for marking sheep. Great End is the most northerly mountain in the Scarfell range and with its imposing sheer north face, rising above Sprinkling Tarn, it is an awesome sight and attracts many climbers. The remains of Neolithic stone axe factories have been found dotted on the slopes of the sheer rock face of Great End. The area around the beautiful shores of Sprinkling Tarn is known for wild camping and fantastic views. The tarn is also a nursery for the Vendace, Britain’s rarest freshwater fish. The small bluish green fish with its silvery flank is a relic from the last glacial period and only survives in the watercourses that flow into Derwent Water and Bassenthwaite Lake. 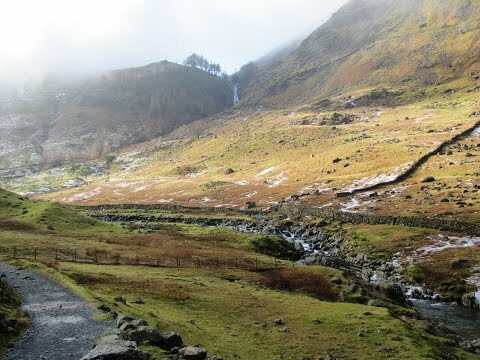 Sty Head is a mountain pass standing at 488 metres and connects Wasdale Head to Seathwaite the two most popular starting points for walks in the high fells. Sty Head just above Styhead Tarn is also a cross roads of paths leading to Wasdale, Eskdale, Borrowdale and Great Langdale and again gives wonderful views of the surrounding area. Sty Head is a dangerous place and the wind can become very wild so there is a mountain rescue stretcher box for emergencies placed next to a large rock which can also provide a little shelter. Styhead Tarn is said to contain wild brown trout and its main source is from Sprinkling Tarn. The water then flows into Styhead Gill before crashing down Taylor Gill Force past Seathwaite and into Borrowdale Valley. We park in the car parking area at Seathwaite. Our walk takes up the left side of Seathwaite Fell and back down on the other side. We walk forward through the farm and the buildings of Seathwaite turn slightly left then right and follow the sign “Sty Head 2 miles” through a gate and with the stream on our right we keep heading forward gradually uphill on the well used track until we arrive at Stockley Bridge, a packhorse bridge. We turn right over the bridge go through the gate and then turn left and keep following the track steadily going uphill with the wall and Grains Gill on our left. We leave the wall and keep following the track going over a footbridge so the stream is then on our right again. The track starts to go more steeply uphill and we can see Great End in front of us. We keep following the path until we arrive at the base of Great End here we go down and up a little dip then turn right, Great Gable and Green Gable are now clearly in front of us. We follow the path, on the level, past Sprinkling Tarn on the right and keep heading forwards to Sty Head. Soon Styhead Tarn is visible on our right and the views beyond the tarn are wonderful with the fells above Keswick peeping through. We head downhill for a short way before turning right and walk close to the left side of Styhead Tarn. We head forward with Styhead Gill on our right, go over a footbridge and starting heading downhill now with the gill on our left. We keep to the path and then we start to follow Taylor Gill Force steeply downhill until we arrive back at Stockley Bridge. We go through the gate over the bridge and turn left and follow the track we started on back to Seathwaite and our parked car. This is a moderate to hard walk with some very steep inclines and declines. Approx 6 miles using OS map 4, The English Lakes North Western Area. Seathwaite is in Borrowdale, south of Keswick in the Lake District, Cumbria. From the A66 take the B5289 just before Portinscale. Stay on the B5289 passing Derwent Water on the right, Grange on the left and then through Rosthwaite. Carry on for a further mile passing Stonethwaite on the left and take the small no through road on the left just before Seatoller. Parking is on the left at the end of the road just before Seathwaite. There are some toilets at Seathwaite and Seatoller but no refreshments. There are two hotels one at Grange and another at Rosthwaite both welcome non-residents. Keswick is the nearest town for public toilets and for refreshments there are plenty of pubs, cafes and shops.